Every police & emergency service, no matter how big or how small, needs to have a plan & human resources in place for real time reporting of incidents in 2013, as well as real time analyzing/processing of information coming in on the case in social media. Staff Sergeant Matt Kavanagh of the Hamilton Police Service Homicide Unit stated publicly during the Tim Bosma case that social media was important and an officer had been dedicated to monitoring social media for the investigation. 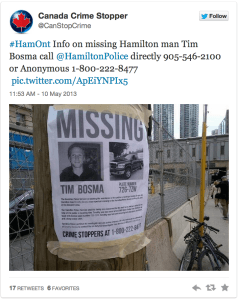 Staff Sergeant Matt Kavanagh of the Hamilton Police Service Homicide Unit stated publicly during the Tim Bosma homicide investigation that social media was important and an officer had been dedicated to monitoring social media for the investigation. Many more community members, police officers and Crime Stoppers programs far a wide were using social media to ask the public to call the Hamilton Police tip line 905-546-2100 or Crime Stoppers anonymously 1-800-222-8477, as well as by Text tips, Facebook leave a tip tab tips and online tips. 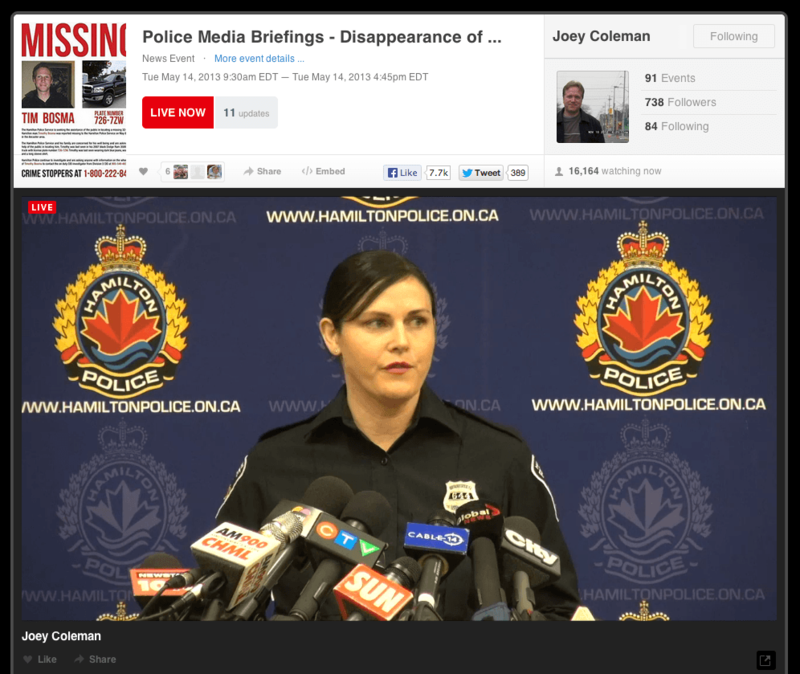 This is a story of social media and communications, specifically about an independent journalist, his camera, a Sony HXR-NX70U, a LiveStream Procaster, a Sennheiser EW100 ENG G3 Combo with Bonus E835 Handheld Mic and the Hamilton Police Service collaborating for community success and safety. The positive relationship is worth replicating worldwide! 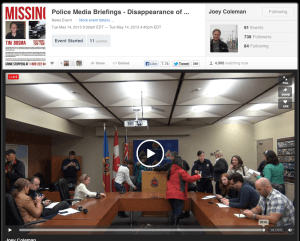 The trust of the local community, local police and fire departments, and now the world has been earned by seasoned journalist Joey Coleman of Hamilton, Ontario, after the Tim Bosma case, but it didn’t get like that over night! Coleman tells me “My business model is based on trust and community service”. Joey chats on about being in the Canadian military in a logistics role, his time based in Toronto including international travel & reporting roles for Canada’s acclaimed MacLeans Magazine, and tireless reporting for The Globe And Mail in his storied career. The story he tells me that catches my attention the most was how he personally intervened when he was in the Military to get an excited father-to-be, a Canadian soldier, home to be with his expectant wife as she went into labour. It was clear to me I was speaking with a human being with a clear purpose, a thought out process, and the payoff and potential is happening and will happen going forward for Joey, and hopefully for many others. The issues at stake are crystal clear: 1. Trust 2. Transparency 3. Accuracy 4. Timeliness of relevant information in sharable format. Some may ask why a cop is writing a blog post about a journalist. Shouldn’t it be the other way around? The answer quite simply is “No”. 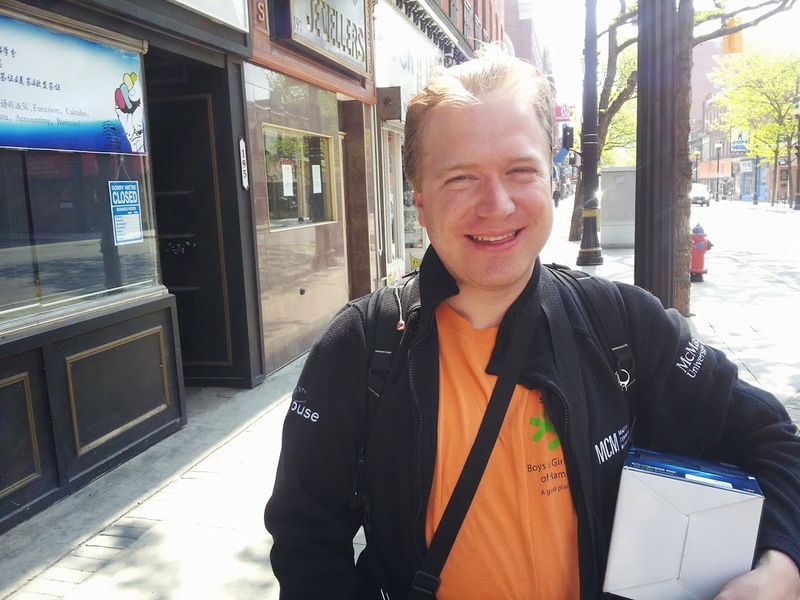 Joey Coleman has broken ground in Hamilton Ontario for police, crime and community safety reporting and is a game changer for police communications worldwide. Joey is a gentleman, a citizen, and he cares about people. He deserves to have the story that I will tell here told! So..here goes.. 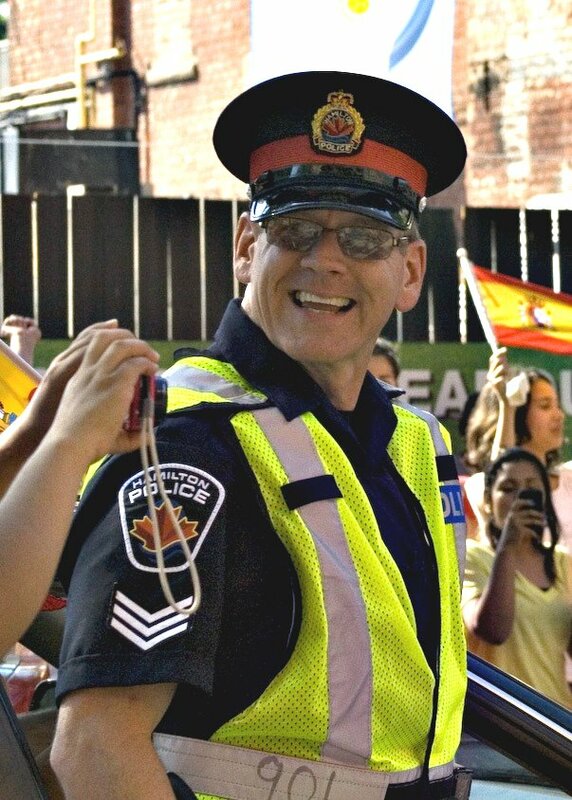 If first learned of the Tim Bosma missing person case when I was attending a meeting at a downtown Toronto Law Office trying to start out a Real Time Crisis Hub to deal with some of the issues of mental health and community safety that come to the police in high volume on a regular basis. As details kept coming in on this case, there was a groundswell of community support which led anyone hearing the story to want to anything and everything to try to help. My mind turned to the computer to try to engage social media as best I could, which eventually led me to finding Joey Coleman and his live streaming. This is a passionate topic for me, as I strongly believe that live streaming of official source information in real time is an essential part of police and Crime Stoppers communications strategies going forward. The question often debated in police communications circles is how to do exactly this in a timely, cost effective and objective way with a workflow and gear that requires a minimum of human resources and cost to purchase/maintain. I have been using Google Plus Hangouts On Air in an experimental way under the guidance of a like minded community volunteer in UK named Mike Downes. I am keenly aware of all the technical and Internet connectivity issues, and the fear of losing the very message you are trying to engage due to unforeseen technical glitches. 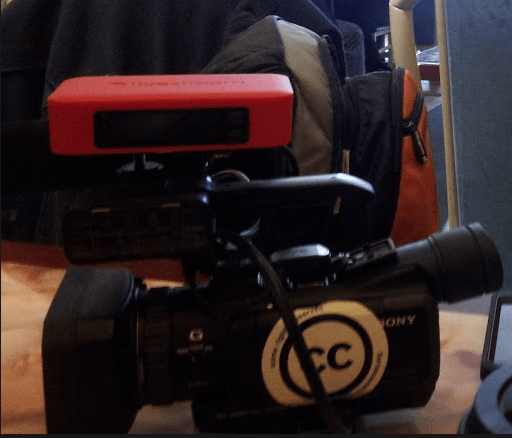 I am also keenly aware of the criticism of “the mainstream” of trying to do live streams like this “for the people”. 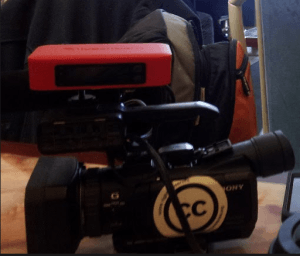 Long story short, Joey Coleman had my undivided attention when his LiveStream broadcast was of excellent video and audio quality and was being done in real time with over 16,000 live viewers! A bonus for me was that as I tweeted out different links of the key message of #FindTimBosma that Joey was providing from the Hamilton Police Media Gallery, the behind the scenes social media manager for Livestream and Twitcam, Christina Russo started tweeting along with Joey and I, eager to help out with any tech issues and plans going forward. On a second “investigative update” press conference in the same day happened, Joey was there with his camera, and despite technical glitches that affected his ability to get the presser out in real time, he had the tech issues fixed in time to be re-playing the entire press conference immediately after it finished. This is a very valuable service for other journalists to be able to fact check, and for anyone, like investigators or community members alike, and potentially a judge and/or jury down the road, can watch the unedited version of events. 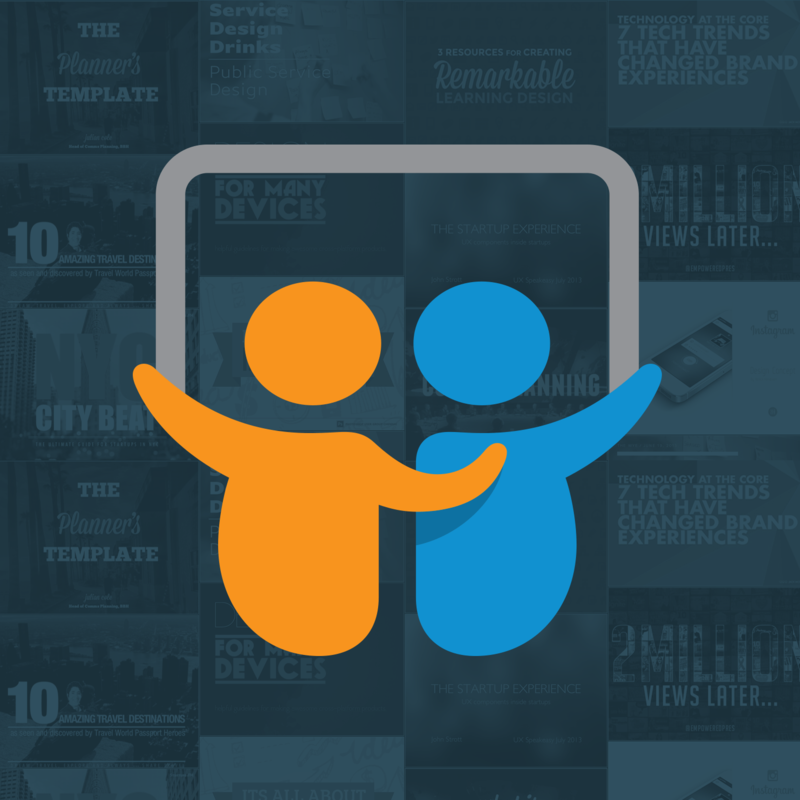 The end winner is the message of helping a family find a loved one is benefited from timely, accurate and good quality information on demand in real time and on archived video afterwards. Sergeant Jay Turner of Hamilton Police Service tweets as @JayTurner901 & @HPSActionTeam4 says he met Crowd Funded Independent Journalist Joey Coleman during a protest when this photo was taken. Joey Coleman says he was impressed with the professionalism and smile of the officer & that he instructed his subordinates to allow the protest in a balanced and safe manner. The relationship now formed between journalist and cop is respectful & benefits community safety on an ongoing basis in Hamilton. “The best thing about our relationship is mutual respect. I talk with Joey as a friend. I don’t have to be extra guarded, because I don’t for a second think he would make me look bad. He would never think to press me for information that he very well knows I can’t give him. That being said, if I screwed up badly, I would expect Joey to tell the story knowing he would be fairly and balanced in doing so. I hope that day never comes though. Back to my talk with Joey, I asked him how he got the Internet connection in Hamilton Police headquarters. 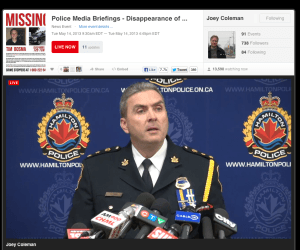 He replied by stating that Hamilton Police Chief Glenn De Caire had approached him at a Police Services Board meeting, because he knew that Joey live streamed a number of community events. 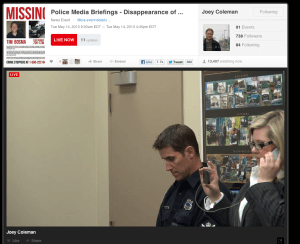 The Chief remarked to Joey that he appreciated his attendance at all the board meetings, and asked him why he wasn’t live streaming the meetings. Joey replied that he needed a hard wired Internet connection for optimum quality for live streaming. 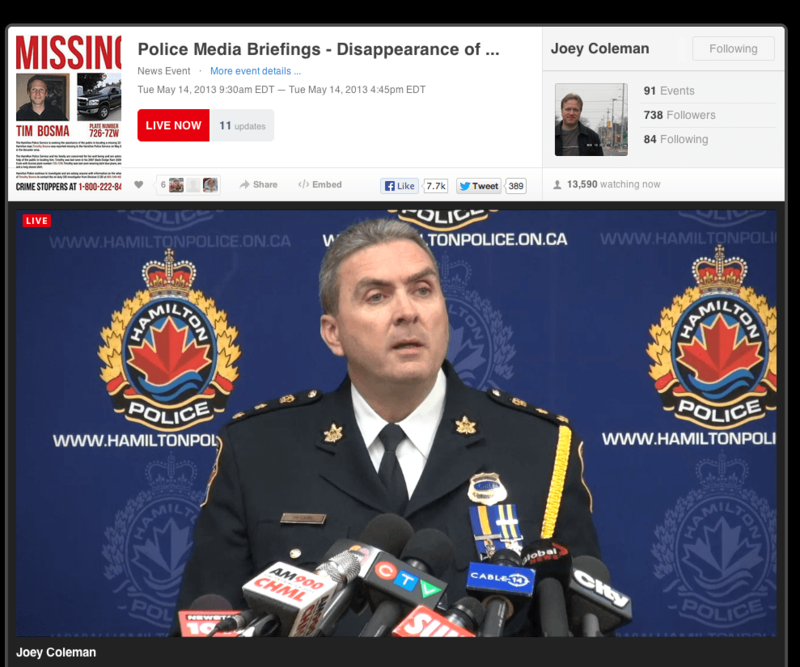 Living up to Chief Decaire’s reputation from his years of service as a popular and “all business” Toronto Police Service high ranking officer, and now Hamilton Police Chief, an Internet hard wire was installed in the board room/media gallery, and the Chief gave Joey permission to use the connection for press conferences too! 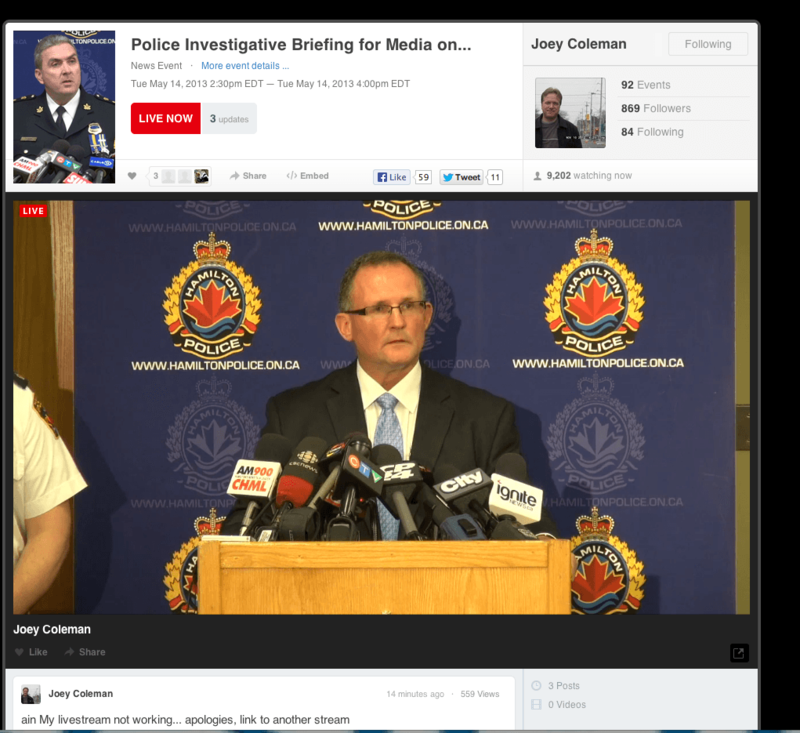 I doubt Chief Decaire envisioned the day when he had to break the news at a press conference to a family and a community that a father and upstanding community man, Tim Bosma was dead, and had been murdered, and over 13,000 people would be viewing live and over 40,000 unique viewers would see the videos that resulted from his vision of installing an Internet connection for an independent journalist in his police station. In conclusion, it is imperative that human resources be allocated by police services for 24/7 social media for communications and investigations. There is no longer a choice that this needs to be done. It is imperative. It is hoped that this blog will provide inspiration and some hands on contacts to replicate something that is working well, and make it bigger and better for local and global community safety. …and a word of caution if Joey is in the room! …when he announces that he is live, and you are a fellow journalist or police officer in the room, be aware that thousands of people are listening! Traditional media like Katie Simpson from CP24 is most definitely not dead! .. but Joey and others like him are charting a path that is growing, and has the trust of the community …. and the cops! 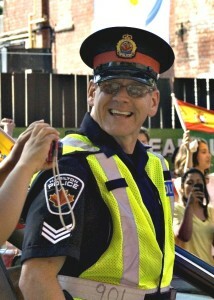 … and for the Media Relations Officers .. If you are thinking that it is just the reporters in the room who are listening at the start and the end of press conference… make sure you ask Joey if he is still live!